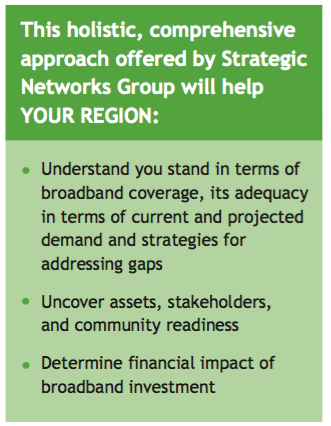 Holistic Approach to Broadband Planning | Strategic Networks Group, Inc.
Why Don’t Networks Match Broadband Supply with Demand? Too often the focus is on the “what” of broadband and looking to build, how to build, or how to pay for it. Such an approach results in building a broadband network and crossing fingers that “if we build it, they will come.” The problem is “they” are not coming. Network after network is being built and business uptake is at best slow, or in the worst case unable to support network sustainability. Strategic Networks Group has been helping communities across the globe, including more than a dozen states, with research and insights to develop strategies and a plan forward to ensure economic vitality and quality of life. Our holistic approach benchmarks both current and future demand at a granular level, coupled with examination of current and potential supply-side solutions. 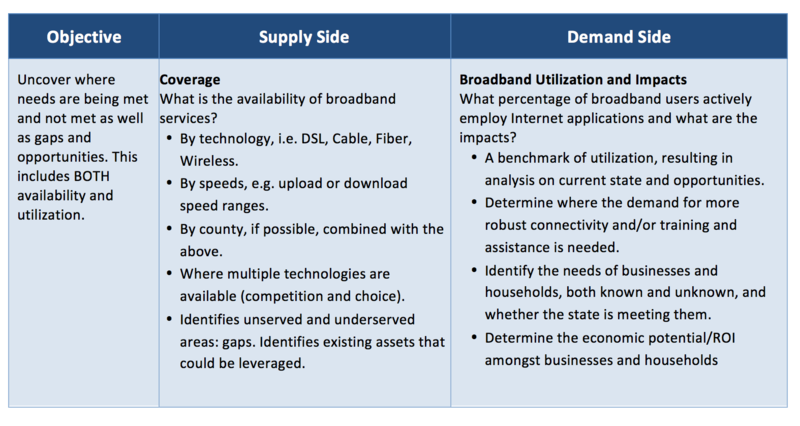 Too often preparation and planning efforts only consider the infrastructure (supply side) of the broadband equation, looking only at broadband availability without sufficient consideration of demand and utilization. Taking time to uncover broadband demand and fill in the gaps where meaningful use will not be achieved without education is critical. As the number of applications and services delivered over the Internet explodes, it is imperative that governments, businesses and individuals in communities of every size have the awareness and capacity to fully benefit from broadband. Planners and leaders need to understand existing gaps, barriers to adoption and best practice strategies to build demand to capture the full benefits of broadband investments. SNG’s comprehensive approach builds a credible, customized business case for infrastructure investments needed to make communities competitive and ensure economic success. SNG will provide your community with plans specifying needed broadband investments and best-practice strategies to grow awareness and maximize utilization. Our comprehensive approach pays our clients back with increased competitiveness, productivity and revenues that translate into job creation and retention and improved quality of life. Provide broadband to unserved or underserved areas. Ensure network sustainability, which comes from consumer demand for high-value services. Use broadband as a platform for economic growth and delivery of smart community services. SNG’s holistic approach assesses both current and future demand at a granular level, coupled with examination of current and potential supply-side solutions. These data points are critical input to develop strategies to maximize the impacts of broadband and digital infrastructure – but it starts by looking beyond availability. Here is how SNG can help your community and your local leaders understand where you stand with broadband and options for moving forward, driving economic development through the right investments. At the heart of this holistic approach is SNG’s eSolutions Benchmarking – which helps clients understand the econometrics of broadband and maximize the benefits of investing in digital infrastructure and expansion of essential services (smart community technologies).